This issue will be about knockdown recovery. The 15oct issue will continue the topic. I WANT TO THANK all the great folks who attended the messabouts at Indiana and Texas! I had a great time and came home knowing how lucky I am! Frank San Miguel and the kids out West with AF3. 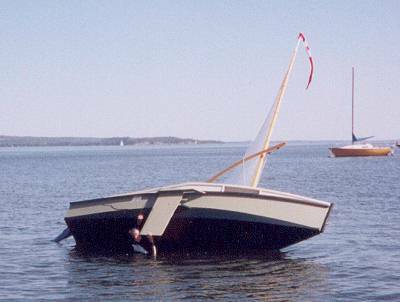 This is a rerun of the 15sep99 issue which featured a capsize test done by Herb McLeod on his then new AF3. I want to keep this one up front because it demonstrates what you need to do when you capsize a sailboat which is not self righting, but rather is self rescuing. 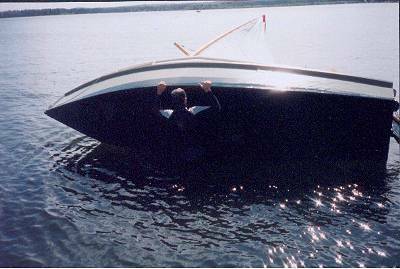 That is you can get it back upright and going again if you are properly prepared and if the boat, like AF3, has ample built in flotation or airboxes to keep it floating high on its side as you recover. A few things I'd like to point out. 1) Herb's tests were done in very benign conditions and if you capsize in really bad conditions recovery could be a lot more difficult or impossible. 2) If you tinker with a design such that you remove flotation or airboxes or enlarge hatches or move them off centerline, etc., the recovery system may not work and the boat may swamp to the point where you cannot recover. 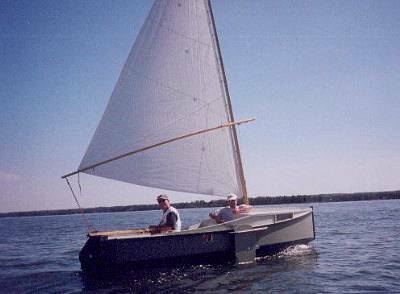 3) If you have a design with no flotation or airboxes at all, such as most any traditional open boat, recovery is about impossible because the boat will swamp completely and be unstable even if it doesn't sink. I now have 14 days of sailing in on the AF3. Alas, no pictures yet of it sailing on the water for the same reason as ever, no one else around to take a picture. Most days I am the only boat on the lake. Had one sail where we traveled 20 miles in one day. 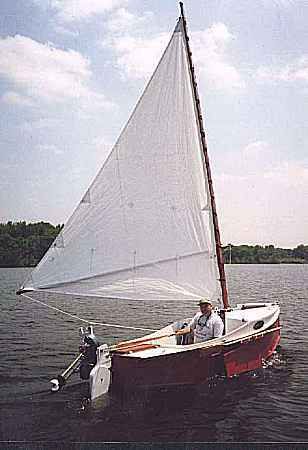 We did a 6.5 mile section that day in 1 hour 10 minutes with the small sail (69 square feet) on a beam to broad reach (lots of wind). Also managed to turn the AF3 on its side that same day. The AF3 floated well was easily uprighted, boarded and bailed out. Everything in the cuddy stayed dry and we managed to not lose any of our gear. But that is not what I am writing about....."
That whetted my appetite and I emailed for more info about the capsize. "I'd like to hear a bit more about the AF3 capsize. In particular: About what angle did it go over?" "I do not know because we were not sailing it at the time. We were both standing on the cuddy deck fiddeling with the sail in a good blow and it went over real fast. We have regularly sailed the hull at up to 20 degrees of heel and it does not feel unstable although I like it best at 10 degrees of heal. I have an inclinometer on the boat(overkill I know) so I know that the angle of heel is a real measurement not a guess. When sailing I had one puff that almost caused a knockdown because I had accidently cleated the main sheet. 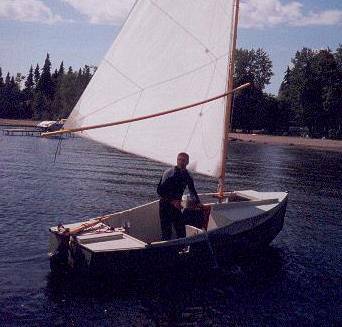 What happened is he boat healed over dramatically and the sail depowered enough that equilibrium was reached and I was able to uncleat the sheet in time to prevent a capsize. Unfortuantly I did not look at the inclinometer, but I was busy at the time.
" How did you right the boat? (Did you use the leeboard?)" "Gord the fellow I was sailing with uprighted the boat while I swam off after our cooler that was quickly blowing away. The water was shallow so he was standing on the bottom. His comment after was that he was amazed at how easily the boat came back up. The second set of plans for the AF3 that I purchased was for Gord as after that experience he was convinced that he wanted to build himself an AF3 this winter. We will see..."
"How did you reboard the boat?" "I climbed on from the stern. I have a small step on the stern that also doubles as a support for my mast cradle. Iput my hands on the stern deck and placed my foot on the step and climbed on board. I must take a photo of this step and send it to you. With the step it was easy to reboard and I could walk around in the cockpit with the water in it and bail it out. Gord then reboarded over the side, which was much more difficult and his choice not mine." "What I will have to do the next time I am out sailing will be to dump the boat in deep water while watching the inclinometer and get you an answer. The water should be warm this week as it is again over 30C today. Unreal for us as it is usually cool, no one has air conditioning here. We were at a folk festival today but came home as it was too hot. I was glad that I caught you in the other night. It was good to talk to you after so many emails. I did get out "sailing" this Sunday. I rolled the AF3 solo both ways in deep water. The AF3 seemed stable to well over 30 degrees and I had the distinct feeling that I could have pushed it back upright until the point was reached that the water started to come over the combing of the cockpit. 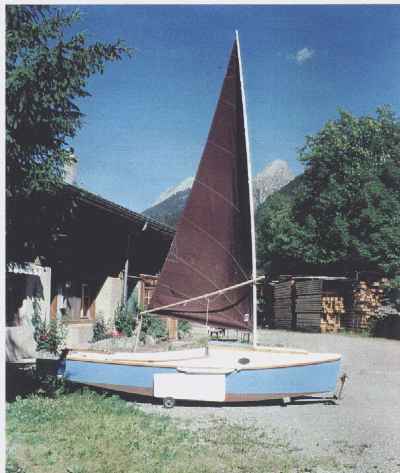 I had my large sail on the boat at the time of the test (103 square feet, 24-foot mast). Winds were almost non-existent. When it was rolled with the leeboard down in the water righting the boat was an easy task as all I had to do was put light pressure on the board. When the leeboard was up out of the water I "walked" with my hands along the chine log (it makes a good grip) to the leeboard and then pulled on the board to pop the boat upright. The comment from the yacht club spectators on the dock was that it came up too easy. They wanted to see me struggle for a while. When righted the boat had 6" on water in the cockpit against the center bulkhead. I pulled myself on board via the stern. I found it easiest to board directly in the middle of the stern because the boat would tend to wallow with the water in the cockpit if I was off to one side or the other. I found turning the rudder 90 degrees and using it as a hand hold helped to reboard. For those with limited arm strength a step on the rudder or a rope step on the stern near the midline would be a great help for reboarding. My son was taking photos I hope some of them turned out. Also asked another boat to take a few photos while sailing maybe we will get you a picture of the AF3 sailing. I am now off for a week to Jasper Alberta with my son for some hiking and canoeing. Herb McLeod seems to be the most energetic and organized person I've met. The scenery of his sailing lake is certainly picture book beautiful. He has warned me that the mosquitoes don't show in the photos. The capsize with two men on the cuddy deck is no surprize. The boat was not designed for that. In fact the idea behind the slot top cabin is to do all sail handling from inside the slot. You can do that if the snotter attachment is kept within reach of a person with his feet on the boat's bottom. I suspect the high snotter attachment Herb is using is to gain more sail efficiciency. That is true enough but after having snotter tackles fail in one way or another I learned to keep the them well within reach. Actually the AF3 capsize seems very similar to my experiences with capsizing my old Jinni. Both boats capsize well before they take water over the side. Jinni had less flotation and I think took on more water. I was able to reboard Jinni over the side. It had lower sides and there seemed to be a trick to rolling over the side just as the boat was rolling upright. Then I had to be very careful to not recapsize the boat because of the sloshing cockpit water. And like AF3, Jinni couldn't quite roll upright until I put some weight on the leeboard. 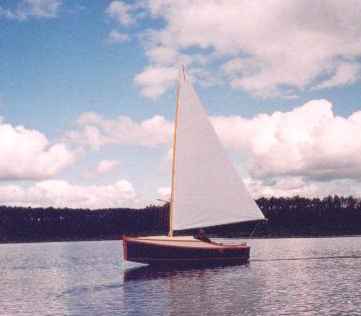 The Jinni had three skid/stiffeners on its bottom which I used as a toehold to regain the capsized boat in the same way that Herb used the AF3 external chines as a finger hold. I may add some similar skids to the AF3 drawings. Herb looks to have gone through all his tests without disturbing any gear because he had it well stowed. Very important. We learn more about an AF3 capsize. The AF3 (the original design study was called "Alison's Fiddle") prototype was built by Herb McLeod of Edmonton, Alberta, with 70 hours of labor. He used spruce exterior plywood made at the plant he has to drive past on his way to the lumberyard. The sail rig is the exact one I used on my old Bolger Jinni and it also found its way onto the Pencilbox design. I align the sail area directly above the trailing edge of the narrow leeboard on sharpies. If weather helm becomes a problem (hardly ever happens) you can dial it out by sweeping the leeboard aft. 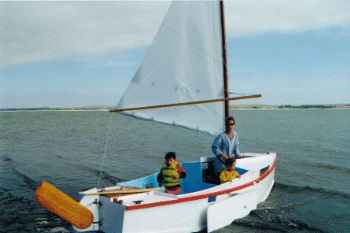 Traditional teaching would have the sail much farther forward but that guarantees lee helm in a boat like this. 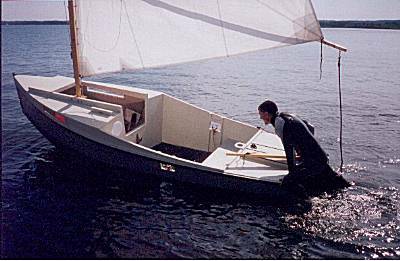 I'll bet the old rule about "lead" in sail layouts applies well to the sharp deep cutwater hulls of traditional planked boats. Also I've shown external chine logs on AF3 and all my sharpies. They are an easy, quick, and strong bottom attachment, but many can't accept their looks. Use traditional interior logs if you wish. Better yet, use epoxy/fiberglass tape chine joints with a healthy interior radius. That makes for a really clean looking boat and the worst rot area in a wooden boat, that chine log, is totally eliminated. AF3 is suitable for camping one person in its cabin and there is not a lot of room in there. 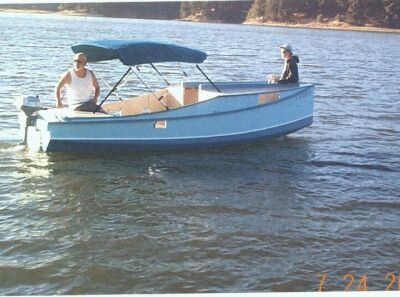 If you would like a larger version of it try the 18' Normsboat or the 20' AF2 that you can find in the online catalog. AF3 uses six sheets of 1/4" plywood and two sheets of 1/2" plywood. Plans are $30. Electron: The California Electron in the water. Right now a four cycle 2 hp outboard has been purchased so the original electric idea may wait a while. I'll have a writeup on this one in a few weeks. Sowsear: I'm told the Pennsylvania Sowsear is finished and has been tested. Should have photos soon.